Ginger is a 20+ year old survivor of the Peaceable Farm case. She is not able to be ridden, but she is an easy keeper and would make a great companion! Ginger's adoption fee is $100. Windcries is a 5 year old, 15.3 hand Thoroughbred gelding. He is very quiet, the trainer said that he is one of the easiest horses she has worked with. He did have a non-displaced fracture in his knee when he was on the track. We have current xrays available. Windcries’ adoption fee is $750. Murph is a charming and personable young gelding. 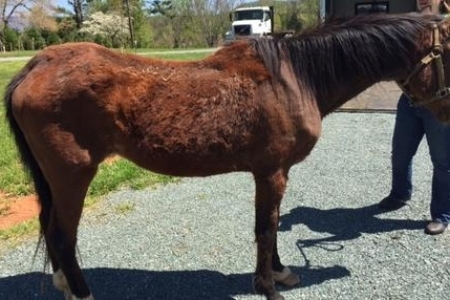 He is believed to be a Quarter Horse/Thoroughbred cross. His sire stands 15 hands tall and his dam is roughly 15.1 hands tall. Murph is weened and ready to find a home of his own. Murph was born on May 28, 2018. Noelle was born on April 13, 2017. She currently stands about 14 hands tall. We have never had a horse who loves people as much as Noelle does. She thrives on attention and is just an absolute joy to be around. Mae is available for adoption! This sweet mare loves attention, hates the farrier and is ambivalent about blankets. She is available as a companion only due to some rotation caused by past founder. 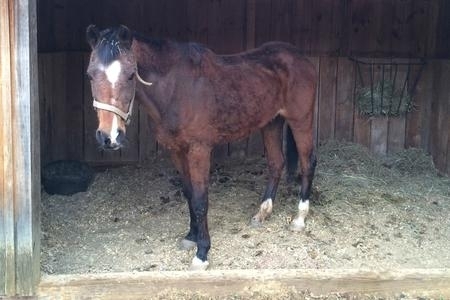 If you have room in your heart and your pasture for this lovely mare please contact us. Charlotte is in her mid teens we believe. She is available as a companion. This kind and easy going mare is a very easy keeper and is barefoot. Charlotte is easy to handle. Charlotte's adoption fee is $100. Ladybug is in her mid to late teens. She is a medium pony who is very shy and nervous. Ladybug would love a quiet home as a companion. She does best with a regular routine. Ladybug's adoption fee is $100. Fanfare is a 17 hand, 6 year old Hanovarian gelding. He is not sound for riding due to a stifle injury which is degenerating. He is a big, handsome pasture companion. These horses are our permanent residents. They are the horse who, due to health issues, age, etc. we feel are not suitable for adoption and need a nice peaceful retirement at Hope's Legacy. Please consider sponsoring one (or more!) of these wonderful horses. Monthly sponsorships start as low as $10 a month. Expenses for these horses usually run about $200 a month. Van, a 35 year old Appendix Quarter horse gelding, was a beginner lesson horse for 25 years. After his retirement, the farm owner was planning to send him to auction. A family member stepped in and brought Van to us instead. Van has few teeth left and is unable to eat hay. He gets large amounts of soaked feed. This feisty guy is quite the character and a big favorite of everyone who meets him. Thank you to Paula Eager for your generous sponsorship and loving care of Van! Donkey is an elderly survivor of the Peaceable Farm case from October 2015. He will be living out his life as a mascot and ambassador for Hope's Legacy. This small, yet very opinionated charmer loves meeting new people. Dolly came to Hope's Legacy from the Virginia Donkey Rescue to be Donkey's companion. He likes horses, but they're just not the same as having his very own donkey friend who never leaves him. 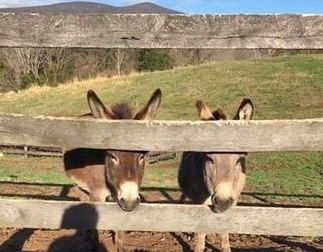 Please consider sponsoring Donkey and Dolly with a monthly donation. Cindy is a 20+ year old Peaceable Farm survivor. Due to some behavioral issues she was not suitable for adoption, however she is thriving, living out her days with lots of green grass and her new friends Oz and Van. Thank you to Parke Capshaw and Paula Eager for your loving sponsorship of Cindy! Arthur is a 30+ year old gelding with navicular. He was surrendered to Hope's Legacy by an owner who loved him dearly but was no longer able to care for him due to financial issues. We had to say goodbye to Gentleman on January 8, 2018. Gentleman was a Peaceable Farm survivor. He came to us on October 19,2015 as one of the seven critical red tag horses we took in from Peaceable. He had severe canker in his feet when he arrived and we were able to treat it and keep him comfortable for over two years. Dakota is a handsome Saddlebred cross who is blind in one eye. Dakota came to us thanks to a good samaritan who saw him starving in a field. Thank you Melody and Gregg for your loving sponsorship of Dakota! Oz came to us as an owner surrender who was no longer able to care for him. He was adopted to a wonderful home but then sadly had to be returned to the rescue. Now he lives out his days with his friends Van and Cindy. Thank you to Parke Capshaw and Tiverton Farm for your generous sponsorship of Oz! Meet Amber Three. She came to Hope's Legacy from Orange County Animal Control in April of 2015. It is hard to see how thin she truly was when she arrived because of her thick winter coat, but she was very thin and completely covered in lice. Several good medicated baths, lots of food and even more love turned Amber into the princess she is today. On Christmas of 2015 Amber found her people when she was adopted by the Thomas Family. They volunteer with Hope's Legacy and fell in love with her. 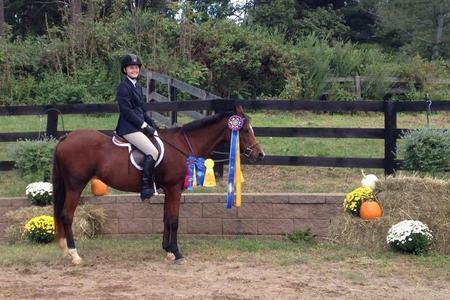 Amber was their daughter Taylor's first horse, together they have galloped through fields, competed in the show ring and at hunter paces and spent countless hours just enjoying one another's company.